EM360° spoke to Doug Rich from HyperGrid about the evolution of hyperconvergence and the advantages to an opex model. ‘Cloud is a journey, not a destination’ says Google’s head of Cloud Professional Services, João Rufino. In this podcast from EM360°, Rufino talks to us about machine learning, how the world is becoming more mobile, more social and how the more people they can get to the cloud, the better it’ll be for the planet. ‘We’re trusting companies to keep our information safe,’ says BH Consulting CEO, Brian Honan. Join EM360° as we sit down with Brian and discuss the main issues with GDPR, what happens if you haven’t started to prepare, and the impact GDPR will have on business. ‘We’re basing our Cyber Security on how secure our clients are’ says Cyberint’s VP Marketing, Elad Ben-Meir. Join EM360° as we sit down with Elad as he takes us through a case study on best security practices from an electronic company hacking into the Western Media and his thoughts on GDPR. jane Frankland, CISO advisor, speaker, author and champion for women in cyber security, looking into what IT and security companies are doing to keep their female employees. Kate Russell, technology journalist at the BBC and author, talks to EM360° about unconscious biased training, the value in a diverse workplace and the changing of the times. Mike Blackman, Managing director for ISE gives EM360° a sum up of the show 2017 in Amsterdam and gives us an insight into what we can look forward to in 2018 and one of the largest integrated Systems event in Europe. 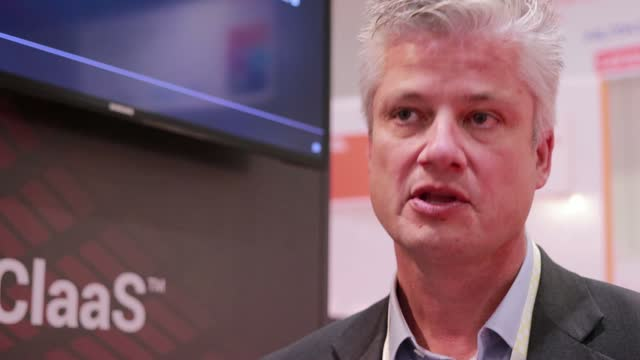 Michael Vanderheeren, Product Manager, Clickshare Barco provides insight into the role of IT in the enterprise and show off their new wireless connectivity collaboration product. In the fifth and final episode of the first series, Donna Burbank is joined by the Vice President of Global Big Data Consulting at Mastercard and a representative from Dell EMC. This episode explores how the digital economy is changing the way organisations do business around the world to such an unprecedented scale that it is now being called the next industrial revolution. There are plenty of tips on how to protect your most important asset - information! Whether you are a Chief Data Officer looking to understand what new technologies and methodologies are available or a businessperson trying to understand how to protect information, listen to this educational podcast to support your business transformation initiatives. In the fourth episode of the series, Donna Burbank chairs a panel consisting of the CTO from DS Virgin Racing Formula E Team and also representatives from HPE and Cloudera. They discuss how new business models are emerging as data-driven technology provides opportunity for change. The also look at whether the CDO, traditionally a ‘back office’ role is now one of the most important roles within an organisation. Whether you are a Chief Data Officer looking to understand what new technologies and methodologies are available or a businessperson trying to understand the challenges, listen to this educational podcast to discover how important data can be to support your business transformation initiatives. Colin Boyle, Product Marketing Specialist at Canon Europe spoke to EM360° in Amsterdam at ISE 2017 and provides insight into the future of AV & IT convergence for the enterprise and the main challenges Canon are seeing in the collaboration space. This is the third episode of the series and Donna Burbank is joined by Erwin, Sandhill Consulting and Swisscom. The panel discuss innovative ways to increase revenue and reduce costs using data-driven digital technologies. Whether you are a Chief Data Officer looking to understand what new technologies and methodologies are available or a businessperson trying to understand the challenges around data quality, listen to this educational podcast to discover how data modelling can support your business transformation initiatives. For the first episode in our Data Transforming Business series, Donna Burbank is joined by representatives of Barclays, Collibra and Trillium Software to discuss the ways organisations think about innovation and growth. The panel discuss how accurate, relevant and timely data is the key to success. Whether you are a Chief Data Officer looking to understand what new technologies and methodologies are available or a businessperson trying to understand the challenges around data quality, listen to this educational podcast to discover how data quality and data governance can support your business transformation initiatives. This is the second episode of the series and here Donna Burbank is joined by representatives of Syncsort and Hortonworks. The panel discuss whether Hadoop augments the data warehouse or replaces it and conclude by looking at how business users and IT can work together in these ecosystems in the future. Whether you are a Chief Data Officer looking to understand what new technologies and methodologies are available or a businessperson trying to understand the challenges, listen to this educational podcast to discover how data quality and data governance can support your business transformation initiatives. Russell Harpman, Director EMEA Revolabs provides insight into the evolution of collaboration trends. Mary Ann de Lares Norris, VP EMEA of Oblong Industries, discusses the future of work, collaboration and how to engage Millennials with EM360. Raised in the digital age, Millennials anticipate instant connectivity, mobile interaction and seamless, collaborative technology as standard in their working environment. Businesses must ensure that their collaboration tools not only enable this approach to working, but are also sufficiently future-proofed so that as technology develops and ways of working continue to evolve, their systems are enhancing this development, rather than restricting it. Ocado may be most well-known as an online grocer, but its plan is to become a technology company – both in hardware and software, which is probably more than twice as hard as only doing software. Combining the two seems obvious for Ocado, since it runs a physical business rather than a virtual one – in that it has several huge warehouse across the country, all handling tens of thousands of individual grocery products and fulfilling hundreds of thousands of orders every month. Managing such a complex business requires software as well as hardware, much of which Ocado bought in from outside companies when it first started in 2000. Over time, Ocado found that it needed software and hardware that were not available on the market, so decided to develop the technology itself, which is what has led to this point where the company has a significant in-house tech team. So significant in fact that the company has launched Ocado Technology and Ocado Engineering as two separate business units, in addition to its core grocery business, which is still called Ocado. We spoke to Neira Jones, Independent Advisor in the FinTech and Cybersecurity industries, to discover what her predicted trends of the FinTech industry are. "First of all, I will make the controversial statement that fintech is not a “revolution”, more of an “evolution”. In fact, innovation doesn’t happen in isolation (fintechs almost always reuse existing infrastructure & technology) and it doesn’t happen by discarding current technologies and reinventing the wheel (fintechs almost always look creatively at what exists today to create something better, faster or more appealing). Secondly, whilst some fintech organisations can help banks address fraud and security challenges (especially those in the fraud prevention, machine learning, threat intelligence, identity and authentication, and other regtech areas), I think that collaboration will be key and that banks can also help fintech organisations with fraud and security (after all, they have been doing it for a very very long time...). Conversely, fintech firms can undeniably help banks become closer to their customers and help them transition from a product centric to a customer centric strategy." A global media channel connecting a network of business IT professionals, and delivering up-to-date content on the latest trends in the enterprise technology industry.